BEAUTIFULLY APPOINTED RV LOT IN THE ''RANCH'' AT HAPPY TRAILS. This 2 story, stuccoed Casita has many features that include: Full kitchen with smooth top range, built in microwave, cabinets, sink, refrigerator and washer/dryer. Also, located in the Casita is a half bath (sink and toilet) and is plumbed for a shower with drain and hot/cold water lines. Upstairs is storage and most can stand. On the back side of the Casita, it is plumbed for an outdoor kitchen. 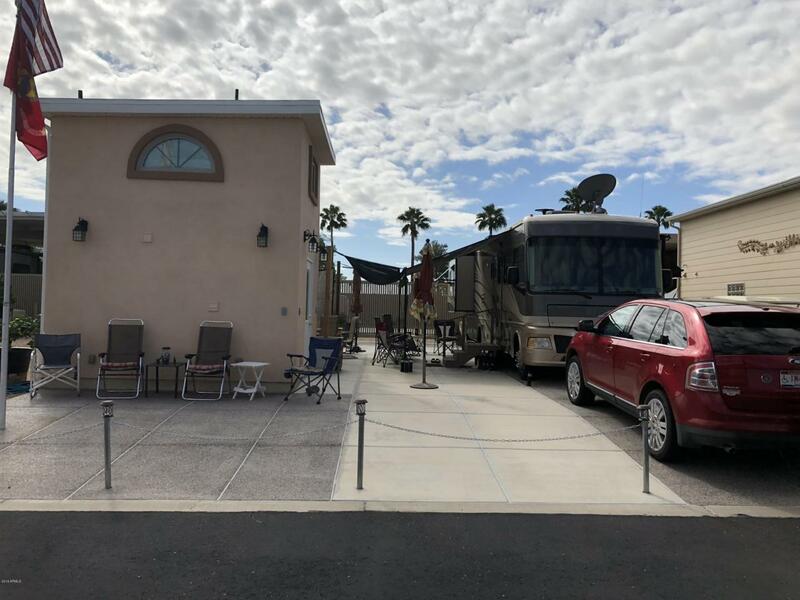 Happy Trails is a guard gated, age restricted, 55+, community located in the northwest valley within the City of Surprise. The area of ''The Ranch'' is separately gated and the CC&R's required a class A motorhome only.